This is an easy way to make something quite special. 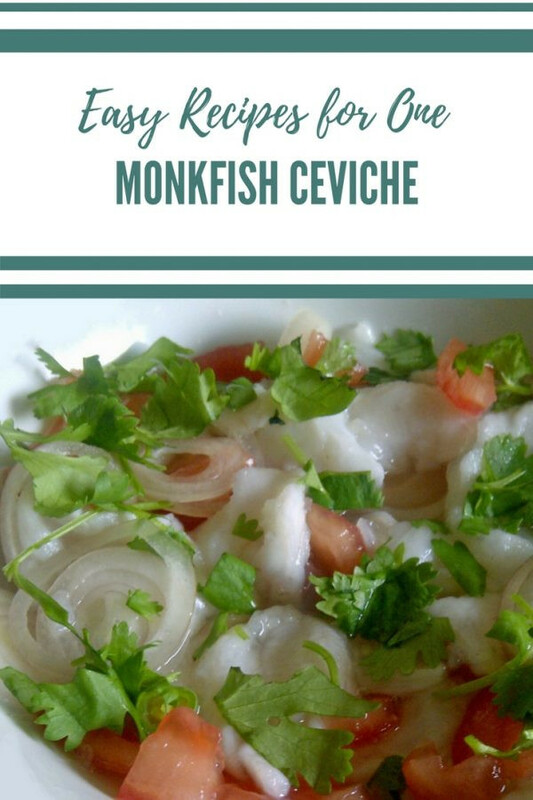 Ceviche is something you could make for a light meal, or serve as a starter. I made mine with monkfish because it is what I had in the fridge but I’ve eaten it made with scallops and I’ve seen recipes for a number of different white fish (including snapper, tilapia and sea bass). And, elsewhere on the blog, I have a rather special recipe for Salmon Ceviche which I learnt from a lovely Japanese Chef. Whatever you decide to make, remember the main thing is that you are not going to be cooking the fish so it needs to be as fresh as possible. Put the fish, chilli, onion and the juice of the lime into a glass bowl and leave to marinade in the fridge for an hour or so stirring occasionally to make sure all the fish gets ‘cooked’. 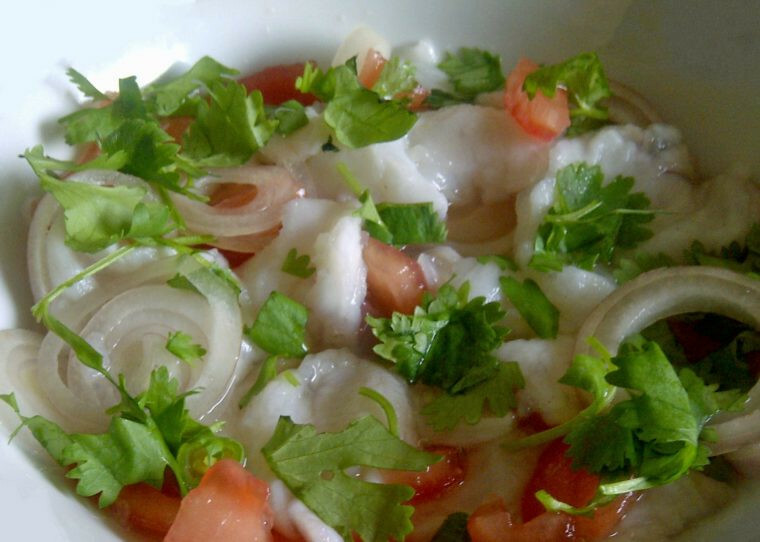 You can tell when the ceviche can be eaten because the fish loses any translucency and becomes opaque. It will keep like this for 24 hours, so don’t worry too much about making it in advance. Just before you are ready to eat, stir in the tomato and garnish with chopped fresh coriander. You can add a little sugar to the lime juice if you find the mixture too sour. And, depending on the fish, you may want to add a pinch of salt. If you’d like to save this recipe for later why not pin it! sounds great, I saw Thomasina Meirs making one on tv the other day and made me really curious to try it out! I’ve never made ceviche but have ‘cured’ raw herring before. You make this sound so simple Imight have to give it a go. I am just going out for lunch and I really hope they have something on the menu as fresh and tasty as this sounds. I am so going to make this….. I prefer to make more of a salsa – either tomato or avocado and tomado. Same ingredients as you but more of a dressing than a salad. i think it makes it easier to eat. I also used to make a version with black bean dressing. You use fermented black beans from a Chinese supermarket chopped up with ,very finely chopped ginger, garlic, a little shallot and some sesame oil and lime juice. Really delicious!